No visit to the Texas Hill Country is complete without a visit to the LBJ Ranch. a greater understanding - and admiration for the man, and his accomplishments. Born in 1908, LBJ was raised very close to the ranch where he lived his whole life. admitted early to the local one room school house were he obtained his early education. The one room school house where the future president first went to school. and was a critical component of the American Dream. to ensure that all children of all income classes would receive an equal education. president signed it sitting next to his elementary school teacher. Below is the classroom where LBJ first went to school. the people via FDR's New Deal Programs during the depression. as a tool to help people as he rose to power. To obtain his goals, LBJ was the consummate deal maker. and used this information to further his legislation. During his presidency which lasted about 1,900 days, he signed over 1,000 bills into law. Almost 1 bill every other day! This is a record pace of achieving not seen before or since. his legislative agenda touched all walks and facets of our society. We stopped for this shot at the entrance to the ranch. come upon the Johnson Family Cemetery. LBJ on right and Lady Bird, on the Left. to the National Park Service. Across from the family cemetery is the boy hood home that LBJ grew up in. This is the small jet that LBJ would use for local transportation. The regular Air Force One - a Boeing 707 - was too heavy to use the LBJ Ranch Runway. The side of the main house. LBJ's private office was on the extreme left of this photo. numerous meetings that would take place in the shade of its expansive canopy. It is currently estimated to be about 350 years old. This is a photo of the front of the home. Behind us is the Pedernales River. The home was set overlooking the river. No photos were allowed to be taken inside the home so I do not have any to show. There were phones in every room - many rooms had 2 or 3 phones. Lady Bird had a separate bedroom. she would simply get up and retreat to the other room for the rest of the night. LBJ had a 3 pack a day cigarette habit. After several heart attacks he quit smoking for 15 years. Air Force One to take him home to Texas for the final time, he lit up a cigarette. he had raised his daughters, served his country, and now it was his time. LBJ only lived about 4 more years. too much smoke, drink and food. He had several more heart episodes. was the president who deepened our involvement in Viet Nam. war but felt the US was trapped in a no-win situation. As much as he tried - it seemed that peace eluded him. Richard Nixon was announcing the peace agreement that ended the US involvement in that war. on non-work days when possible as its less stressful but a mechanical issue made us wait. I've been trying to keep the bus at 100% perfect. No issues on the to-do list. and it seems as soon as I have it perfect some little thing pops up that needs my attention. was at 100%. That lasted about a day. and an error code popped up on my engine display. The bus has dozens of sensors. Well the error code said there was a problem with my DEF tank temperature. down the road. So we delayed departure till Monday so I could get repairs lined up. which certainly makes it less painful. early enough they would look at it that day and it was probably a quick fix. So it was south 2 hrs to San Antonio. By 130 the paperwork was complete and a tech had the computer hooked up to the data port. 15 minutes later we were backing into a bay. The tech had to drop the DEF Tank and replace the whole head sensing unit. I-10 to Kerville where we are now situated for the week. getting me in and out. and discovered that my roofline clearance lights were out in front and back. A big windmill sits smack in the middle of the park. And our view out the front window. cool, and beautiful dry air. The park is all decorated for Christmas already. Below - the building decorations are reflected in one of the many ponds on the property. Below - The entrance to the park. sitting in the pilots seat on short final to Newark. More reflections - a bridge and gazebo. LED clearance lights work but I think the next rain might knock them out again. It must have been a bad caulk day at the factory the day the put them on. 5 amber front lights, and 5 red rear lights. They will arrive here tomorrow from the Tiffin Factory. I will make sure they are caulked well when I install them. I'll wait till we get to NM or further west before I start to pull the lights off. Dryer weather there you know. Western White House, and the Pacific War Museum in Fredericksburg. so I imagine that there might be a Schnitzel & Kartoffelpuffe in our future. Well the Great Barbecue Taste-off has come to an end. 12 Bones uses a unique dry rub with names like Blueberry Chipolte. It gives the meat a spicy flavor. Its a bit too spicy for Kates liking. It is well smoked - again a bit too smoky for Kates liking. drier than our other visits. 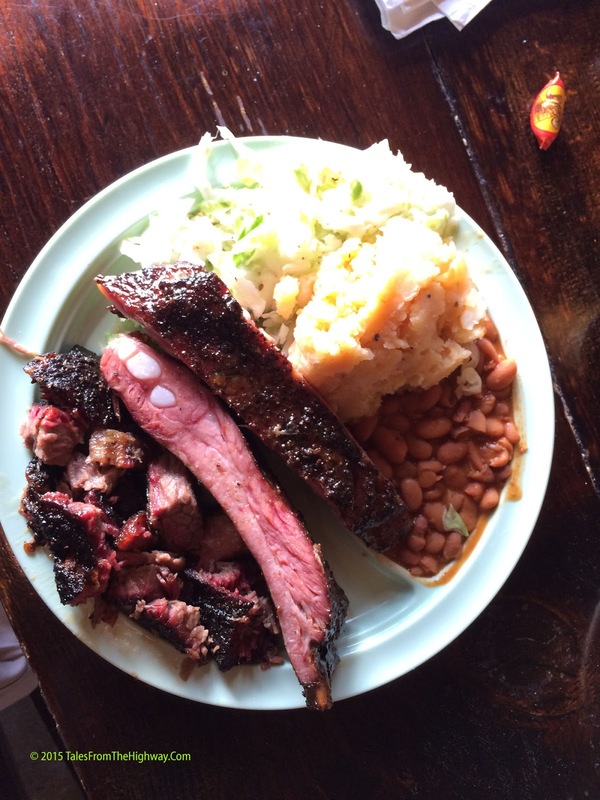 barbecue, then you can't go wrong with 12 Bones. better than the South location. Plenty of seating inside and outside. They close at 4pm so don't delay. We give it 7.5 out of 10.
vinegar served at 12 bones. The meat was all tender and juicy. It turned out to be our #2 choice. We gave it 8 out of 10. Next on the tour was the Salt Lick in Driftwood. Rated on Ambiance alone this place would be a 10. Set in a scenic location there is a lot of indoor and outdoor seating under the Oaks. make an afternoon out of it. wood fire, it is less smoked than the others. 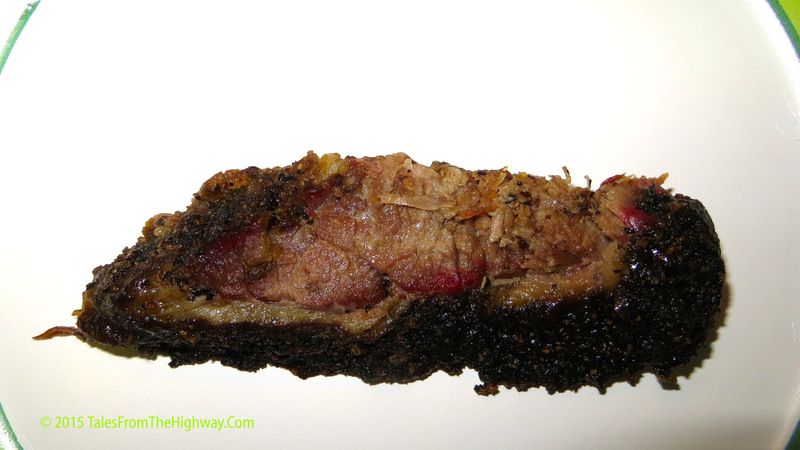 The Burnt ends Brisket was delicious. Sweet caramelized bark that burst with flavor. The ribs were tender and juicy. There were two sauces - a mild and a spicy. The spicy was still tame. The sauces added a nice flavor and I enjoyed them but I've had better. The sauce however is very personal taste. We gave it a 9 out of 10. 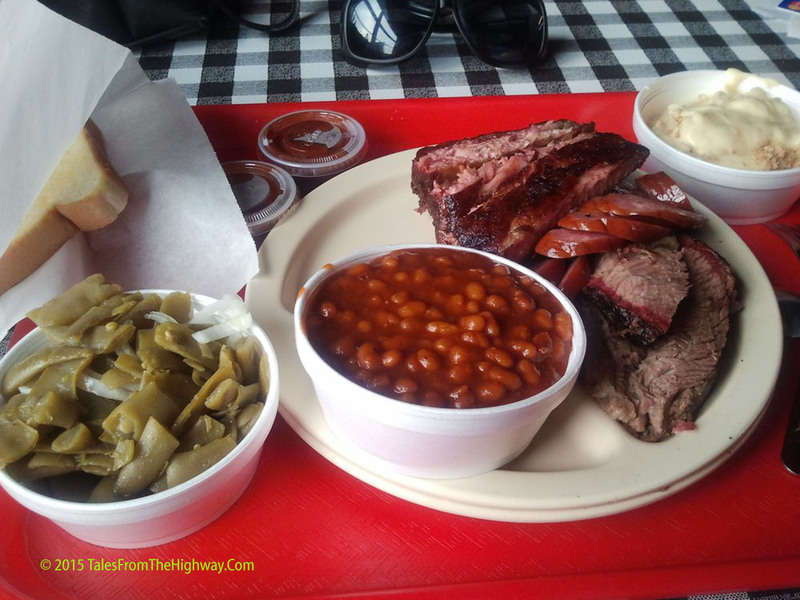 Last on the stop was Kerlin BBQ in Austin. Served from a food trailer - like many outlets in Austin. This is a mom and pop operation. 1 min after opening time, the line had already formed. This place has been discovered. Now the photos below do not do this food justice. and sported a light bark with a pronounced smoke ring. It was so tender that you would pick up a piece and it would fall apart. It seemed to be just the right mix of smoke flavor. The pork ribs were juicy and fall off the bone tender. The sauce was a light tomato vinegar base with some celery seed that gave it a nice twist. We ordered this food for take out and ate it for dinner. with some rock and roll music playing. Austin is a college town and many of the patrons looked like they were students. A blue cheese Cole Slaw. Wow. A great twist on a BBQ favorite. but the flavor of the jalapeño just added a unique twist. these sides make that possible. We'd have to give it a good 9.5 out of 10. I'm still searching for that 10. The only way to truly judge these places would be to sit down and eat it side by side. Doing it weeks and miles apart makes it difficult to fairly compare. If you are ever near any of these places... stop in and give them a try. Its a tough job but someone has to do it. While here in Austin I had to make some quick repairs. The bus has automatic leveling/stabilizing system. When we arrive somewhere I push a button to start the process. one in each corner of the bus. Each jack is independently controlled by a solenoid. The system is computerized and will extend each jack as necessary to level the bus. put each leg down enough to stabilize the bus (stop the rocking) but not level it. Recently I noticed that one of the legs kept retracting slowly overnight. After some troubleshooting I determined that I had a malfunctioning solenoid. fluid reservoir - the springs on the jacks would then pull the jacks back up. Solenoid was on its way to the campground via UPS 2 day. The photo below shows the pump, the 4 lines - one to each jack - and the pump motor. you are working by feel in the blind. There is only about 2" of room on the right side of the pump. familiarize myself with the layout. Below is the old solenoid that I removed. It is quite hefty and weighs about 5 lbs. It simply screws into the back of the pump and you reconnect the electric. valve seat that controls the hydraulic fluid. For reference here is a shot of it with my hand. the grey hex shaped area by the cam on the left side where the wires are exiting. It did not require a lot of effort to remove or replace. leg remained extended all night so it looks like we are back in business. before we pick up jacks and head to Kerville, Tx tomorrow for a week.